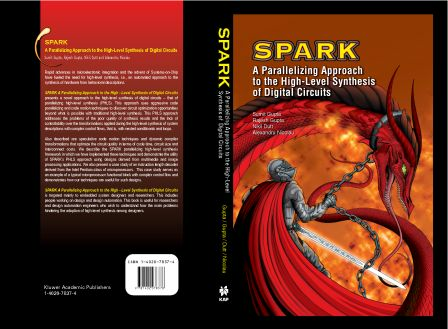 For my doctoral research, I developed a C-to-VHDL synthesis framework called SPARK that employs a set of innovative compiler, parallelizing compiler and synthesis transformations to improve the quality of high-level synthesis results. This synthesis framework is very similar to a VLIW compiler, albeit with notions of hardware concurrency and hardware costs of transformations. Thus, SPARK employs parallelizing transformations and techniques such as speculative code motions, loop pipelining, Percolation Scheduling, and the Trailblazing code motion technique, while performing resource sharing and operation chaining. The SPARK methodology is particularly targeted to control-intensive microprocessor functional blocks and multimedia applications. We validated the effectiveness of our approach and evaluated the various optimizations for large real-life applications such as the Instruction Length Decoder from the Intel Pentium and multimedia applications such as MPEG-1, MPEG-2 and the GIMP image processing tool. This work has been done in collaboration with Intel (Strategic CAD Labs). Previous Research (short lived): Software Synthesis using Timed Decision Tables: includes source release that has a VHDL parser in it. Organizing Committee: International Conference on High Performance Computing (HiPC), 1994-96. Organized a CAD/VLSI series of talks (1997-98) at UC Irvine by researchers in Southern California. Best Paper Award, International Conference on VLSI Design, 2003. UC Irvine, Information and Computer Science Department Dissertation Fellowship, Spring, 2003. Best Student Paper Award, International Conference on VLSI Design, 1998.